A.E. 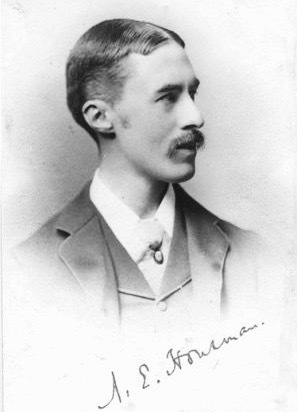 Housman (1859-1936) spent much of his life as a Latin professor at Trinity College, Cambridge, concentrating on arcane areas of Latin scholarship and acquiring a reputation as aloof and demanding. He seemed an unlikely candidate to have written one of the most beloved poetry collections in English. His A Shropshire Lad was published in a tiny edition in 1896. According to Housman himself, his style had been shaped by Shakespeare, the Border Ballads of Scotland and the poems of Germany's Heinrich Heine. Inspired by those models, Housman created a unique voice that reminds us of poetry's ability to produce heart-shaking emotion with a handful of words. Housman's collection was a book people loved to read and share: Thomas Hardy received a copy at Christmas in 1902. Later admirers included Robert Graves, Robert Lowell and Sylvia Plath. Randall Jarrell liked Housman's poetry so much he wrote his Vanderbilt master's thesis about it. T.S. Eliot said simply, "We should all write poetry like Housman, if only we could." AUDIO: Samples of Ralph Vaughan Williams' song cycle, "On Wenlock Edge"
As i am certain you may appreciate, to induce particular at this can take an extended time, and lots of follow and, with its restricted application, solely players UN agency area unit very serious concerning learning the way to play guitar tend to fret concerning it. For more information about Music & Bandsplease visit our website. Wow, such a beautiful poem. I always was in found of nice little poems. This one is perfect. When I was younger I loved more the long ones, but then I understood that they all are very similar. Then I discover for myself such a beautiful styles of writing art like Hokku, Tanka and little sonnets. Back in the days when I was moderator on Essayshark http://writingservices.reviews/reviews/essayshark, I even had my own column about poetry. Good old days, thank you for reminding me about it!